The John Lauchlan Memorial Award is a cash award that exists to perpetuate the bold and adventurous spirit that John Lauchlan exemplified in his mountain exploits. It strives to promote the development of Canadians seeking a technical climbing challenge at an international level with financial support that non-commercial expeditions have difficulty accessing. The 2018 awards were announced at the 2018 Banff Centre Mountain Film and Book Festival. Quentin Lindfield Roberts, Juho Knuuttila and Tim Banfield will travel to Chamlang in the Hongu Valley of Nepal in the fall of 2019. “Our primary objective is to attempt the unclimbed 2,000-metre north face of Chamlang (7,319 m). Sam Eastman-Zaleski and Rob Homer (son of the late accomplished Rockies climber George Homer) will travel to the Cirque of the Unclimbables to attempt to be the first Canadian team to open a new free route on Mount Proboscis. The Southeast Face (a.k.a. Original Route) was first climbed by Jim McCarthy, Royal Robbins, Layton Kor and Richard McCracken in 1963 at VI 5.8 A4. In 2001, Jonny Copp and Josh Wharton freed the Costa Brava variation VI 5.12-R to the Original Route. In 2010, Lorna Illingworth, Madaleine Sorkin and Emily Stifler established Women at Work VI 5.12R), a significant variation to the Via Costa Brava (itself a variation to the 1963 Original Route, climbed in 1992 by Spanish climbers Jose Maria Cadina and Joaquin Olmo at VI 5.11 A1). The John Lauchlan Memorial Award aims to encourage and assist Canadian climbers who are following in the footsteps of what made John a pioneering climber – exploring new terrain and testing new limits. This year’s award committee included Kim Csizmazia, Dave Stark, Chelsea Lindsay, Jim Elzinga, Brandon Pullan, Barry Blanchard, Steve Swenson, Ian Welsted, Alik Berg and James Blench. 2018: Sam Eastman-Zaleski and Rob Homer to attempt a free route on Proboscis. Quentin-Lindfield Roberts, Tim Banfield and Juho Knuuttila to attempt Chamlang. 2016: Max Fisher and Fred Giroux in Coastal Mountains of Canada. 2015: Alison Criscitiello and Anna Smith in India Himalaya. 2014: Mark Taylor, Kris Irwin, Darren Vonk, and Ian Welsted for their exploratory trip to climb new routes in the Revalations Mountain Range in Alaska. 2013: Paul McSorley, Joshua Lavigne and Jason Kruk for their trip to attempt an unclimbed route on the south face of Thalay Sager in the Gharwal Himalays (India). 2012: Carlyle Norman and Cian Brinker for their trip to attempt an unclimbed route on Aguja Bifida in Patagonia. 2011: Chris Geisler, and Jason Kruk for their trip to Patagonia for a “fair means” attempt to climb the south east ridge of Cerro Torre. 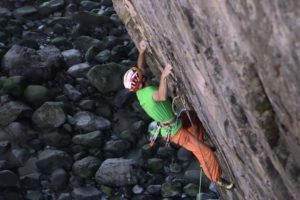 Their goal is to fore-go using any of the compressor placed bolts placed by Maestri on the controversial first ascent. 2010: Chris Atkinson and Chris Jones for their trip to the unclimbed Tangmonja (6328 metres) in the Nyenchen Thangla Range in Tibet. 2009: Eamonn Walsh, Ian Welsted, and Raphael Slawinski for their trip to Pumari Chhish East (6900 metres) in the Hispar Glacier region of Pakistan. 2008: Simon Meis and Josh Lavigne for their trip to Hainabrakk in Pakistan. 2007: Lilla Molnar and Jennifer Olson for their trip to Batura Muztagh Range in Pakistan. 2006: Jeff Relph, Jon Walsh, and Paul McSorley for their trip to Baintha Brakk (The Ogre) in the Karakorum Range in Pakistan. 2005: Katie Holm, Aidan Oloman and Katherine Fraser for their trip to the Siguniang Mountains in Western China. This was the first time that the award was given to an all-womans expedition. 2004: Jon Walsh and Andre Ike for their trip to the Devil’s Thumb, Alaska. 2003: Sean Easton and Connie Amelunxen for their trip to Peru. 2002: Guy Edwards and John Millar for their trip to Mount Swachnd in the Garwal Himalayas, Northern India. 2001: Jia Condon and Rich Prohaska for their big wall and sailing trip to Greenland. 2000: Steve Holeczi, Josh Briggs and Eamon Walsh for their trip to the S.S.E. ridge of Mt. Logan in the St. Elias Range of northern Canada. 1999: Sean Easton, Connie Amulunxen and Keith Reid for their trip to the Devil’s Thumb in Alaska. 1998: Jia Condon, Rich Prohaska and John Chilton for their trip to the S.E. face of Mt. Logan in northern Canada. 1997: Tim Pochay and Grant Statham for their trip to Kitchatna Spires in Alaska. 1997: Sean Isaac and Guy Edwards for their trip to Towers de Paine in Patagonia.